Mr. Smoka | way above the level. 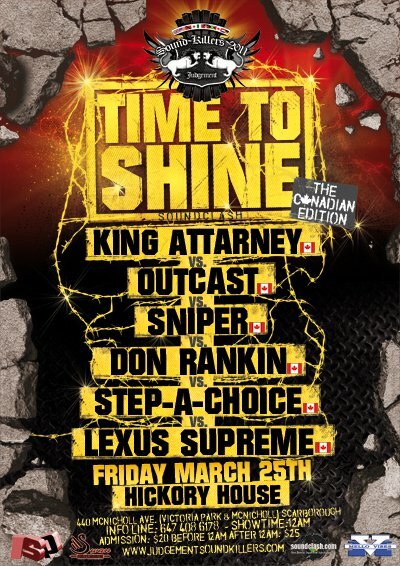 Mr.Smoka, of Guns-E-Num Clash Promotions, on behalf of the promoter team, recently announced the line up for the canadian stop of the Judment Soundkillers Time 2 Shine Clash Tournament, which is promoted by Jill from Soundclash.com, going down on March, the 25th, in Scarborough. Mmh, some of us wouldn’t consider most of them sounds as upcoming but whateff. 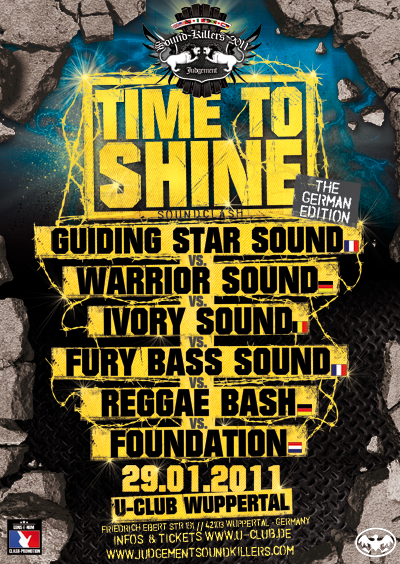 Don’t forget about the german edition of Soundkillers 2011: Time To Shine Competition, taking place this saturday, January the 29th, in Wuppertal, Germany. Germanys reigning Clash-Promoter, Mr. Smoka of Guns-E-Num, just released a wicked Download-Link-Package as a christmas gift for all you guys, including a nice mix-cd, a baddd 100% Dubplate-Juggling-Audio and a exciting Soundclash. Just click the images to download. This Saturday, the 13th of November, its all about the european championchip tagteam clash called Bring Your Tunes And Defend Your Sound, happening in Mainz, Germany. The contestants will be Sting like a Bee and Jackpot Sound for Germany versus Mixmaster J and Natural Affair on behalf of the UK. Host will be Tommy $ outta the City Lock. The reclash will happen in London afterwards. Well known german Soundclash Promoter Mr. Smoka just hitted me up with some info about his upcoming Soundclash Competition Series, so check this out! Ajax of Blunt Posse Sound outta the Bronx just posted the audio for last weekends War Fever Clash against Herbalize-It on his Facebook Site. The Promoter of the Clash, Guns-E-Num, decided to gave the audios to the sounds involved, and let them spread the clash if they want to, but decided not to release them by himself cause him a litte vex bout the turnout of this clash. All the people who always scream for the recording of such an event within not even a day since it kept, and live inside a regular driving radius but didn’t show up should be ashamed to bloodclaat! Because of such habits not many people are still willing to put their effort and money in to promote soundclashes, stageshows and big dances. Nevertheless I’m gonna post the audio still, because i want to gave the sounds and especially Mr Smoka, of Guns-E-Num, a little shine and let you hear what you have missed. Maybe you will show up at the next event of Guns-E-Num, or any other promoter, and support the thing. EDIT: THIS CLASH HAS BEEN POSTPONED TO THE 16. OF OCTOBER! If you’re a real supporter of the art of Soundclash, and you’re around the NRW/Cologne-area this Friday, I advice you to check out this Clash that Mr. Smoka of Guns-E-Num put up in cooperation with Soundvibration from Bonn at the Kolbhalle in Cologne-Ehrenfeld on Friday, the 18th of June. Contestants will be Lazerforce from the UK and Northcoast Fire from Mainz, Germany.